It was a family affair for two identical twin astronauts – one newly returned to Earth and the other training to launch on his own space mission – as they reunited Thursday (March 17) in Houston. Scott Kelly, who returned to Earth this week from a stint commanding the International Space Station, met up with his brother Mark Kelly – commander of final flight of shuttle Endeavour next month – at Ellington Field near NASA's Johnson Space Center in Houston. They posed for photos, two-of-a-kind astronauts, before heading home. Scott Kelly and cosmonauts Oleg Skripochka and Alexander Kaleri landed their Soyuz TMA-01M spacecraft on the snowy steppes of Kazakhstan in central Asia on March 16, after spending 159 days in space. Shortly after landing, Scott spoke about what he most looks forward to when reunited with his brother. "Just seeing him and talking to him – seeing how he's doing," Scott told NASA spokesman Rob Navias in a post-landing interview. "Talking in person versus a satellite phone with very sporadic coverage that you're always waiting for when the satellite passes over – that'll be nice." Mark Kelly will command Endeavour on its final mission to the space station, which is slated to launch on April 19. His wife, Arizona congresswoman Gabrielle Giffords, suffered a gunshot wound to the head during a Jan. 8 shooting in Tucson that killed six people and injured 13 others. Scott Kelly was 226 miles (363 kilometers) above Earth when his sister-in-law was shot. Kelly said it was a particularly hard time to be in space, but he tried to help his family and friends cope with the aftermath. When he landed, he was wearing a bracelet with a peace symbol, heart and the word "Gabby" – Giffords' nickname – on it to show his love and support for his sister-in-law. "It certainly was difficult. Now, having said that, it's something that both Mark and I are kind of trained to deal with as military pilots – just putting your personal issues aside and focusing on what your job is," Kelly said. "Although I would have preferred to be able to help him in person and assist as best I could, I recognized that my place is on the space station, and just focused on my work, and called him and my kids as much as I could. There's not much support you can provide in space other than emotional and on the phone, but I tried to do that as best I could." 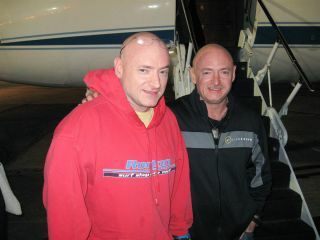 The Kelly brothers are both Navy captains and are the world's only identical twin astronauts (Mark is older by six minutes). At one time they were slated to actually meet up in space when their two missions were scheduled to coincide. But delays to NASA's most recent shuttle flight of Discovery caused a ripple effect that pushed Mark's flight on Endeavour back by months, missing the window to meet Scott in space during his five-month stay at the station. Kelly recounted the highs and lows of his months-long mission, which included overseeing the arrival of several different unmanned cargo craft, and one final visit from the space shuttle Discovery and its six-astronaut crew. "Certainly the low is when Gabby was shot, along with all the other Tucson victims," Kelly said. "When you get a phone call from the chief of the astronaut office who wants to talk to you immediately, you know it's not good news." But, the station residents were also involved in continuing crucial science aboard the orbiting laboratory, and the crew was kept busy with work to maintain and upgrade the station. "I think it's really hard to say there's one major accomplishment," Kelly said. "I think it's really the accomplishment of the whole team in putting such a complicated plan together and executing it – I guess that's what I'm most proud of." And as the Soyuz spacecraft pulled away from the station on its return home, Kelly reflected on the enduring legacy of the space station and the international cooperation it took to build the massive orbiting complex. "It's such an amazing research facility that we've built, so impressive that as human beings we were able to accomplish something like that," Kelly said. "It's a place I'm going to miss. I certainly looked forward to getting back to Earth, and I have lots of things I look forward to, but I definitely miss the space station."